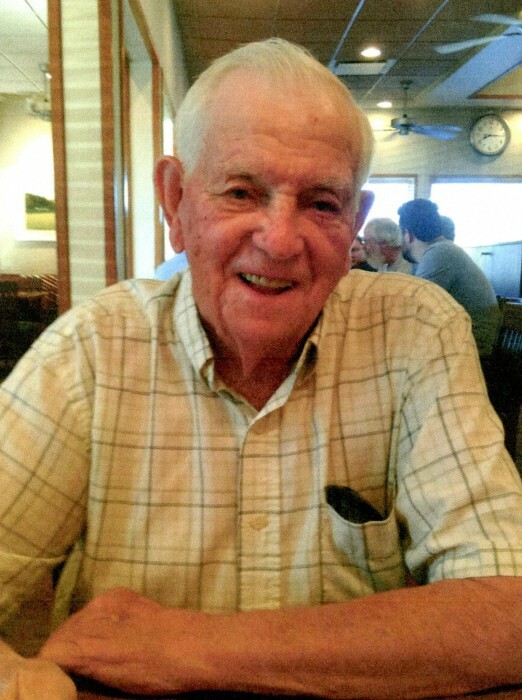 Grover Robertson Sr., 93, of North Vernon, passed away at 4:00 p.m. on Saturday, April 6, 2019, at his residence. Born January 14, 1926, in Frozen Creek, Kentucky, Mr. Robertson was the son of George and Eliza Bea (Haddix) Robertson. Mr. Robertson worked shipping for Arvin’s in Columbus retiring in 1989 after 39 years of service with the company. He enjoyed eating breakfast at Brick Street Restaurant in North Vernon and Feltner’s in Old Paris, playing Skipbo, doing word search puzzles and working on the farm. Survivors include sons, Earl Robertson of Elizabethtown, Carl (Michelle) Robertson of North Vernon and Grover (Barbara) Robertson Jr., of Commiskey; daughters, Irene (Mike) Taylor and Cathy (Greg) Marsh, both of North Vernon, and Rose (Allen) Meixner of Westport; step-son, Marion (Elaine) Haney of Alamogordo, New Mexico; sisters, Lola Barnett of Lagrange, Kentucky, and Golden Wells, Nellie Robertson and Rosie (Delmer) Hounshell, all of Jackson, Kentucky; grandchildren, Kathy Wilson of Las Vegas, Nevada, Steve Taylor of Florida, Rob (Michelle) Taylor of Bargersville, Connie (Zach) Hyden, Sheri Taylor, Dakota Taylor, Nettie (Pepper) Robertson, Shane (Sarah) Marsh, Toby Marsh and Cindy (Tony) Callahan, all of North Vernon, Tony Robertson of Rome, Georgia, Tallon Robertson of Scipio, Elizabeth Robertson of New Albany, Jessica Meixner of Fullerton, California, Matthew Meixner of Westport, Rachel (Isaac) Stafford of Taylorsville, North Carolina, Samantha (Josh Weiskopf) Burns of Petersburg, Illinois, Nikki Burns of Bloomington, Illinois, Suzan Oswald of Seymour and Baylee (Levi) Walters of Grammer; step-grandchildren, Christie Haney of Champagne, Illinois, Tim Bargas of Hartselle, Alabama, Ray (Melissa) Haney of Beech Grove, and Bryan Haney of Roswell, New Mexico; 38 great-grandchildren; one great-great-granddaughter and one great-great-grandson due in August of 2019. He was preceded in death by his parents; brothers, Arlie and Arthur Robertson; sisters, Beulah Rose, Fern Gonterman, and Malvery Lindon; and grandson, Ronnie Taylor. A funeral service for Mr. Robertson will be conducted at 10:00 a.m. on Friday, April 12, 2019, at the Dove-Sharp & Rudicel Funeral Home and Cremation Service in North Vernon with the Rev. Dale Boyd officiating. Family and Friends may call at the funeral home on Thursday, April 11, 2019, from 4:00 p.m. until 8:00 p.m. and one hour prior to the service on Friday. Burial will be in the Hillcrest Cemetery in North Vernon. Memorials may be made through the funeral home to St. Jude Children’s Research Hospital.